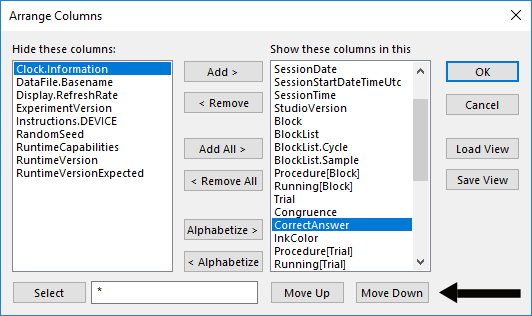 By default, the columns in a data file are displayed in alphabetical order within hierarchical levels (e.g., Session, Block, Trial, etc.). Columns may be rearranged by selecting the column, clicking and holding the left mouse button to change the cursor to an arrow on a small box, dragging the column header to a new location, and releasing the left mouse button. A dotted red line provides feedback concerning where the column will be located after the left mouse button is released. 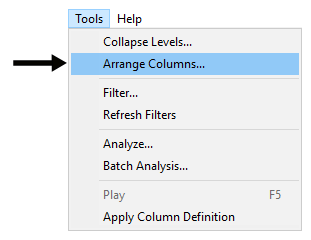 Alternatively, the Arrange Columns dialog may be displayed using the Arrange Columns tool button on the toolbar, or by using the Arrange Columns command in the Tools menu. 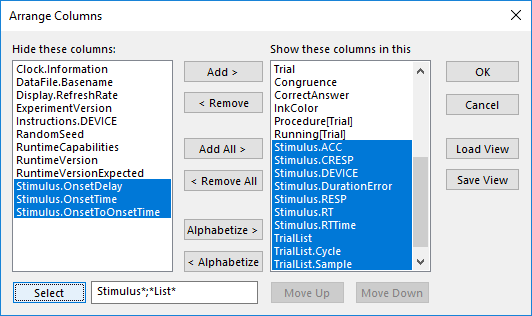 The Arrange Columns dialog box allows arranging columns within the list of currently displayed columns by selecting the column name and using the Move Up and Move Down buttons to move the column to a new position. The Arrange Columns dialog also allows the reorganization of the spreadsheet through the designation of which columns to hide or show. To hide a column so that it does not appear in the spreadsheet, select the column in the Show list and click the Remove button. The column will then be placed in the Hide column. Likewise, to display any hidden columns in the spreadsheet, select the column in the Hide list and click the Add button to add the column to the Show list. When a hidden column is added to the Show list, the column is added to the end of the Show list, and is displayed as the last column in the spreadsheet when the dialog is dismissed. Use the Move Up button to reposition the variable if desired. The Add All button moves all hidden columns (selected or not) to the Show list. The Remove All button moves all unhidden columns (selected or not) to the Hide list. The Alphabetize buttons allow the items in either list to be ordered alphabetically. The Select field may be used to highlight columns in both lists matching a specific filter. In the Select field below the Hide these columns list, type the desired filter into the edit box and click the Select button. Any column in either list matching the filter will be highlighted. The highlighted column then may be added or removed from the respective list. The selection is not case sensitive, and multiple filters may be entered at one time. Multiple filters are separated using semi-colons. Filters may also include the wildcard (*) character.